Improve your presentation skills. Learn about audience engagement, PowerPoint, presentation technology, speaking techniques and more. Respond, question and suggest. Your ideas are always welcome. Connect with Charles on LinkedIn or Twitter (@CharlesGreene3) or at Charles@CharlesGreene.com to receive new presentation tips each week. Remove all jargon, acronyms, clichés & overused words – Speak in short sentences. Use simple words. This is not a call to dumb down your message, but a request to speak clearly. Communicate your message in the most direct way possible. Your words should engage your audience as they listen to your message. Technical jargon, acronyms and overused words get in the way of that connection. Be clear. Be direct. Connect with your audience. Present without slides – Has your slidedeck become a grand cheat sheet? Toss your visual crutch. Tell your message without slides. You’ll increase engagement with your audience as they give you their full attention. Imagine, facing your audience, instead of glancing at the screen behind you. Will this make your presentations better? Yes, it will. Present without slides. Go easy with slide deck transitions & animations – With PowerPoint, KeyNote, or Prezi, simple transitions are best. Keep the focus on your message. Flip/Flop, louvered, and chessboard transitions distract from your message. The same is true for animations. Use them to highlight slide text or visuals. Stars, streaks, and flares misdirect your audience’s attention away from your slide information. Go easy with slide deck transitions and animations. Smile. Your presentation audience will like you more. An occasional smile will also slow down your pace. Most presenters talk too fast. Smiling will make you pause. Take the time to connect with your audience while they become more attentive during the pause. Smiling will also deepen your appearance of confidence. Connection, attention, and confidence all from a smile. Try it. Smile. Transform complex concepts into easily understood visuals. Watch and learn from master presenter Hans Rosling – Take a look at this 52 second presentation. It’s the shortest TED talk to date. In the video Hans Rosling demonstrates and explains a very complex concept with just a few stones. His message is clear, the final statement strong, and the whole presentation is memorable. Hans Rosling understands his message so well that he can deliver it in varying lengths with very different props, i.e. stones(:52), washing machines(11:17), storage bins with PowerPoint(10:16), and futuristic live-action screens(4:48). How does your long presentation compare to the shortest TED talk? Direct your nervousness toward positive output – Train your butterflies to fly in formation. Use your last minute jitters to focus on positive results. Make sure your remote has fresh batteries. Double-check your slide deck. Make sure you know how to turn your mic on. Then, check to verify that it’s off. Breathe deeply. Pause. Think about delivering an awesome presentation. Direct your nervousness toward positive output. Speak at the appropriate language level – Know your message well enough so that you can deliver the key points at the appropriate language level of your audience. An astronomer talking about space would, hopefully, use different words, details, and stories for different listeners, scientists, venture capitalists, or high school students. What words and stories for your subject would you choose? How would they differ for your peers versus people with some knowledge of your work, or a group of high school students who might have no insight into your work? Speak at the appropriate language level. Acknowledge the person who introduces you – Demonstrate good manners. Make a connection with the person who presents you to the audience. Don’t be in such a rush to deliver your message. It might seem like a small thing, but that those few seconds of connection will leave a strong impression with your audience. Be sure to include your contact information on your handouts – Your presentation handout might be the only place someone can find your direct contact information. Mention that your contact information is on the handout and that you are open to follow up on the presentation. Lose the laser pointer – Put tape over your laser pointer. Stop using a laser to draw attention to a small object on a slide. It probably means that the object is too small to be clearly seen. For better highlighting options try animation, zoom, or add an additional, more detailed, slide. Lose the laser pointer. Reduce your slide text by 50% – You have too many words on your slides. You think you need them all, but you don’t. Take away as many words as possible. Leave only critical information – no paragraphs, no sentences. Your slide deck reveals too much information and the extra text turns your audience into readers that get ahead of your thoughts. Create slides with the fewest key words possible. This forces your audience to listen to your thoughts on the subject. Humanize your data – Enliven data with stories of people. Numbers are fine, but your audience will relate to them better and remember them longer if they can see people, ideally themselves in your numbers. Stories that reflect why your numbers are important to people will engage your audience on an emotional level. Show your data’s relevance and relationship to real people. Humanize your data. Arrive early & get your prep out of the way – Getting ready for your presentation always takes more time than most of us reserve for the task. Arrive really early, especially if you are using technology. Your audience doesn’t want to see you fiddling with cables, remotes, and the projector. Be fully prepared when they come into the room. Have all things in place and ready. It will give you time to meet your audience, listen to their stories, and learn how your presentation can meet their needs. Arrive early. Put your audience first – Learn the top concerns of your audience and then forget about yourself and focus on them. Tell them up front what’s in it for them. Give them what they want. Answer their questions. Provide them with information that they can use to improve their situation. Address the top concerns of your audience and they’ll hang on your every word. Put your audience first. Update your slide deck – “PowerPoint slides are like children; no matter how ugly they are, you’ll think they’re beautiful if they are yours.” – Scott Adams, The Joy of Work Take a hard look at your slides. Just as all of us could stand to lose 5 lbs, your slide deck would benefit by losing some text or removing some distracting design element. If you can’t find anything to change, get a second opinion. Ask your presentation audiences. I’m sure that they’ll have some ideas for you. Accept all public speaking opportunities – Take every chance, big and small, to stand in front of an audience and deliver a message. Be the person who is willing to speak for your company, association, or cause. Actual face-time is the best way to improve your public speaking skills. Use short talks to try something different. Use long presentations, 20 – 40 minutes, to work on one particular skill, e.g., speaking more clearly, having more eye contact with your audience, or using fewer speaker notes. Three books for better PowerPoint – Think of your slides as blank canvases to be drawn on, instead of pages to be written on. Use more images and fewer words. Here are three highly recommended books that espouse this idea – PresentationZen by Garr Reynolds; Resonate by Nancy Duarte; and Beyond Bullets Points by Cliff Atkinson. Video filmed in Copenhagen, Denmark. Begin 2015 anew – Become a better presenter starting today. Say, “In 2015 I’ll do _____.” Fill in the blank with the following options. Take an improv class. Present without notes. Use more of your own images. Attend the 2015 Presentation Summit in New Orleans. Become a member of NSA or Toastmasters. Improve your public speaking. Begin anew today. Think of presenting as theater – Most presentations are flat and lifeless. Some are down right boring. Lift your speaking by adding a dash of dramatic technique. Change your vocal pitch. Pause for effect. Use a prop instead of a slide deck. Leave the lectern and get close to your audience. Bring some emotion to your topic. Don’t bore your audience. Think of presenting as theater. Spend no more than a minute trouble-shooting a tech problem in front of an audience – Trying to resolve a tech problem while presenting is frustrating, for you and your audience. Sometimes the issue can’t be corrected without spare parts and lots of time. Be kind to your audience. If your tech problem needs more than a minute of your time, move on and return to your presentation. Your audience will appreciate your commitment to your message, instead of to technology. Spend no more than a minute trouble-shooting a tech problem. Be a consistent speaker – Presentation opportunities can vary greatly; short or long, casual or formal, seated or standing. Regardless of the situation, you should be consistent in speaking skills. Always open and close strongly. Always use a proper structure for your topic. Always engage your audience. Always use vocal variety. Always know your subject. Always speak clearly. These are the fundamentals of good speaking. Be a consistent speaker. Learn to leave the lectern – Are you anchored to the lectern when you speak? Move away from it. Leave your notes. Get closer to your presentation audiences. You’ll engage and connect more deeply as you approach them. Yes, it may take lots of practice to free yourself from hiding behind the lectern, but the payoff will be huge. Learn to leave the lectern. Black Slides Matter – Place blank, black slides between your text slides. 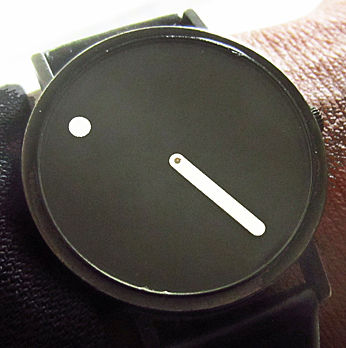 They give you time to breathe during your PowerPoint presentations. Present your text and then fade to black. Black slides will return the audiences attention back to you, the presenter. Black Slides Matter. Anticipate your audience’s top 10 questions – All subjects have set of commonly asked questions. Discover the top 10 FAQs of your presentation subject. Then prepare succinct responses for all 10 of them. For bonus points, have 2 different responses prepared for the top 5. Don’t be caught off guard. Practice your responses. Be ready and prepared. Anticipate your audience’s top 10 questions. Transform your key message points into memorable sound bites – Your presentation may contain critical information, but if your audience can’t remember your key points then all your work is for naught. Raise the probability that that your key points will be recalled after you’ve left the room. Create message points that are clear and succinct. Strong short statements will help your longer message be more memorable. Attend Rick Altman’s Presentation Summit to elevate your presentation IQ and improve your PowerPoint skills – Creating successful presentations is about more than just software. It is about crafting sharp messages, creating intelligent presentation design, employing efficient techniques with PowerPoint and other apps, and realizing natural and genuine delivery. This year’s Summit, 12th, will be held Oct 12 -15 in San Diego, CA. Be educated and inspired by a presentation conference that you’ll never forget. Attend this year’s Presentation Summit. Video: Attend the Presentation Summit, Oct. 12 – 15, 2014 in San Diego. Accelerate your growth and expand your horizons. Try something new – Still delivering your message the same exact way every single time? Your presentation is either perfect or getting a bit stale. To avoid the latter, flex your speaking skills. Find new stories. Use different quotes. Seek out new presentation structures. The injection of a new presentation element could be the needed boost that elevates your speaking skills to a higher level. Freshen up your presentations. Try something new. Proofread your slides – Spellcheckers don’t check for context. Make sure you proof your slide text for correct word usage & grammar. Attorneys process claims, not clams. Bait, not bat, is used for fishing. Small typos sneak in when lots of slide text is used. Try less text on your slides. It should make the typos easier to spit. I mean spot. Proofread your slides. Prepare your presentations in 3 steps – Successful presentations require proper preparation of your core message and its supporting elements. 1) Define your point. 2) Frame your message. 3) Refine your story. Even if you know a subject well, your investment in preparation will pay off by having your core message remembered more easily. Create your own image bank – Shoot and use your own images for your presentations. Don’t use clip art. Don’t use boring “stock” images. Start creating your own personal image bank of hi-res photos. Photograph scenes, signs, and objects for later use. Start shooting now. Add new images weekly. You’ll have a great collection of images that are all yours. Video – Use a wireless remote and move closer to your audience. Cut your physical attachment to your computer. Use a wireless remote and create more opportunities to get close to and connect with your audience. Try the Wireless Stopwatch Presenter with Laser Pointer or the Keyspan PRE-EZ1 by Tripp Lite. Have some fun when presenting – Find some level of enjoyment in it. If you can’t, you’re probably doing something wrong. Maybe you’ve got too much information, or you don’t know your subject well enough. Change something to make your presenting more enjoyable for you. Because, if it’s not fun for you, imagine how your audience must feel. Have some fun when presenting. Include your contact details on handouts – Your presentation handout might be the only place someone can find your direct contact information. Mention that your contact information is on the handout and that you are open to follow up conversations about the presentation. Include your contact details on handouts. Lose your laser pointer – Put tape over your laser pointer. Stop using a laser to draw attention to a small object on a slide. It probably means that the object is too small to be clearly seen. For better highlighting options try animation, zoom, or add an additional, more detailed, slide. Lose your laser pointer. Read Judy Carter’s The Message of You – Author & Speaker Coach Judy Carter shows you how to find the power of humor of your own story. If you’ve got a story to tell, her book will guide you all the way from the page to the stage. Even if you never want to publicly tell your own story, Judy gives experience-tested advice on improving the structure and delivery of all messages. Read The Message of You by Judy Carter. Uncover the top concerns of your audience before you present. Every audience has a unique set of priority concerns. With interviews and probing questions, find them and then provide solutions to them within your presentations. Hitting their top concerns in your presentation will let you delve to deeper and more specific concerns during the Q&A. Convert your nervous energy into positive results – Everyone gets butterflies before giving a speech. The key is to train yours to fly in formation. Focus your nervous energy toward positive outcomes; double-check your props, rehearse your opening & closing statements, review your slide deck. Convert your nervous energy into positive results. Subscribe to weekly presentation tips – Nick Morgan and Garr Reynolds are a couple of the sites to which I subscribe. Every week, at CharlesGreene.com, I post a new short presentation tip. Search for past tips on specific issues. Find your favorites and then tune in each week to gain new insights on speaking skills. (Learn more at CharlesGreene.com & Twitter @CharlesGreene3) Subscribe to weekly presentation tips. 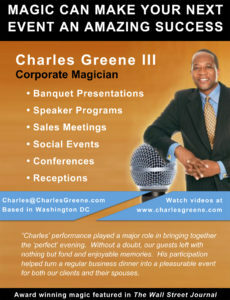 Learn more public speaking tips from Charles. Subscribe to his Presentation Magician channel. Use vocal variety – The best words will sound flat when delivered with a monotone voice. A dull voice will put an audience to sleep. Vary your vocal pitch and pace during your presentation. Add pauses at appropriate moments to create tension or emphasis. Imagine your voice being the sole method of engaging and holding your audience’s attention. Think radio. Use vocal variety. Watch a great speech in a movie – Movie speeches can provide a variety of lessons in word choice, phrasing, oratory, diction, and pausing. Here are three great movie speeches – George C. Scott in Patton, address to the 3rd Army; Kenneth Branagh in Henry V, St. Crispin’s Day Speech; Colin Firth in The King’s Speech, 3 September 1939 radio broadcast. Seen in a theatre on a large screen, these speeches can create life long impressions. However, even when watched on small screen or listened to through ear buds, these words will move your emotions. Listen and learn. Watch a great speech in a movie. Don’t read while presenting – Presentation audiences get really annoyed when you read large amounts of text, word for word, from your slides. According to an international survey on PowerPoint presentations by Dave Paradi, it’s the number one annoyance of presentation audiences. Reading your slide text aloud generally means that you have either too much information or you don’t know your information. Distill your message. Have fewer, but more powerful points. Practice more. But, please – Don’t read while presenting. Welcome your audience – Start each presentation with a sincere welcome towards your audience. Thank them for their time. Let them know that their presence at your presentation is important and makes a difference. Welcome your audience. Begin anew today – Take the opportunity of a new year to become a better presenter. Say, “In 2014 I’ll do _____.” You can fill in the blank the following options. Read something by Garr Reynolds. Take an improv class. Present without notes. Use more of my own images. View more TED talks. Attend the Presentation Summit. Become a member of NSA or Toastmasters. Begin anew today. View 6 options to make yourself a better speaker in 2014. Let things go –“Finish each day and be done with it. You have done what you could. Some blunders and absurdities no doubt crept in; forget them as soon as you can. Tomorrow is a new day. You shall begin it serenely and with too high a spirit to be encumbered with your old nonsense.” Ralph Waldo Emerson 2013 is over. Let things go. Lagniappe – It’s a term that means a small gift given after a larger purchase. Think “baker’s dozen.” Prepare a small unexpected gift for your presentation audiences – web links to more involved notes, a copy of your favorite “Top Ten” tips, video highlights of your message, or, maybe, the opportunity for a short phone follow up. Be creative. Gift your audience. Lagniappe. Connect your numbers and statistics with stories of real people. Numbers are fine, but people relate to the trials and triumphs of other people, not numbers. Present your numbers with human stories. What do your stats mean for real people? How is human life affected by your research? Give your data some humanity. When an audience can see people within your numbers, they’ll be more emotionally involved with your message. Get close to your audience – Take away the barriers that separate you from your audience. Move closer. Connect better. Barriers can be physical or mental; lecterns, hand-held notes, poor seating arrangements, secured mics, thoughts of failure, or your style of dress. These and other barriers can prevent you from fully engaging with your audience. Get close to your audience. Employ the rule of thirds – The rule of thirds is a basic principle of visual design. The rule uses an imaginary grid to divide visual space into thirds horizontally and vertically. Placing a key element on a line or an intersection gives it more visual strength. Use the rule of thirds to enliven your images. It will take your images off center and lets them command more of the viewer’s visual attention. See the “Rule of Thirds” in use. Employ the rule of thirds. Pause after each slide transition – Allow your audience absorb the new image. Give them a few seconds to soak it in. Use this time to breathe. Rest. After a moment of silence, begin to speak. This pause serves to let everyone relax. It provides a “down” moment before proceeding with new information. It can make each new slide a true transition, instead of a streaming blur. Pause after each slide transition. Never memorize your speech word for word – At best, memorized speeches sound canned. At worst, you might forget a line and get stuck mid-speech. For presentations, it’s better to create a plan of three message points and then speak briefly on each point. As you practice your presentation you’ll develop a pattern of words and phrases that naturally fit your message points. The key is practice. Just like champagne, a great presentation takes time. Don’t memorize your speech word for word. Scare your audience – Start with a harrowing/shocking statistic. It’s one way to get your audience’s attention. “75% of this room will not retire comfortably.” “39% of teens have received or sent sexual images on their cell phones.” Shock your audience. Grab their attention. Then, give them your solution to their scary situation. Scare your audience. Don’t use clip art – Clip art is boring. It’s generic art that lessens the impact of your presentation message. Illustrate your points with strong graphics. Use bold photo images. Go full screen with your images. Make an impact with images that engage and attract your audience. Use visuals that are bold, strong, and captivating. Don’t use clip art. Develop your improvisation skills – The ability to “think on your feet” while presenting is a skill that’s best learned off stage. Each week, pick a random topic, think of 3 talking points for the subject, and then speak on the subject for one minute. Advance this to a daily exercise and you’ll quickly become better at speaking “off the cuff” on any subject. Develop your improvisation skills. Distribute handouts after your presentation – Handouts distract when given before a presentation. People generally look through them in advance and then make decisions about the presentation based on the handout. Let your audience make choices based on your actual presentation. Keep the focus on you, your words, and your presentation materials. Distribute handouts after your presentation. Refine your presentation, regardless of the length, to a few clear points. Try only 3. Work to know those points from every possible angle. Think of all the possible questions regarding those points. Learn how to rephrase your points. Develop alternative ways to support your points; stories, props, slides, whiteboard, etc. Hans Rosling, a data visionary, knows his messages so well that he can communicate complex ideas with very simple props. Be in control of your message. Know it inside & out. Accept all public speaking opportunities – Take every chance, big and small, to stand in front of an audience and deliver a message. Be the person who is willing to speak for your company, association, or cause. Actual face-time is the only way to improve your public speaking skills. Use short talks to try something different. Use long presentations, 20 – 40 minutes, to work on one particular skill, e.g., speaking more clearly, having more eye contact with your audience, or using fewer speaker notes. Give your presentation slides more impact. Use only one message per slide. Your audiences will appreciate the clarity of your message. Think about not using a slide deck – Seen too many slides lately? So has your audience. Change things up. Don’t use a slide deck. Find another way to illustrate your message points; use a flip chart, prop, or tell more captivating stories to captivate your audience. Too many presenters use slides as a crutch. Don’t fall into that trap. Offer a better presentation experience by improving your audience engagement skills and leaving your slide deck at home. Try it once. You might just love it. All Presidential residents of The White House have known that audience, preparation and practice are the keys to successful presentations. If you want your presentations to more “Presidential”, remember these keys to successful presentation. 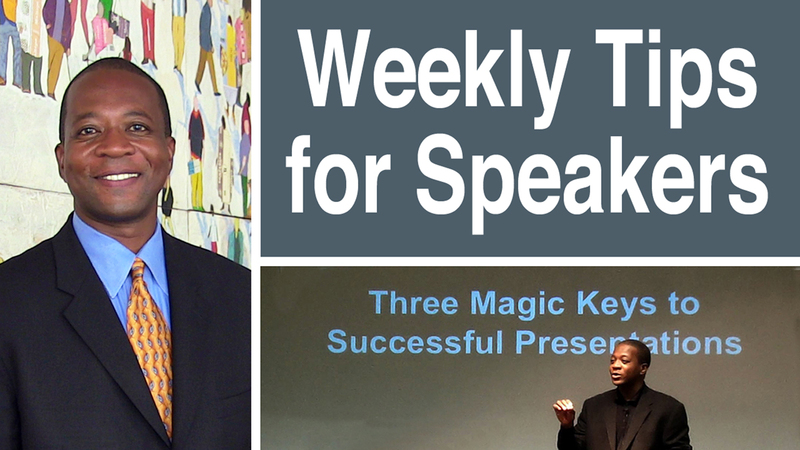 Video – Create a public speaking checklist. Ensure that you have everything that you need for a public speaking moment; create a checklist. Refer to your public speaking checklist before and after the presentation. Before to make sure that you bring everything. After to make sure that you return with all of your gear. Add items to your personalized list. I just added “wallet” to mine. Yes, I had my gear, but had left my wallet at home. Video – Think of your slides as canvas, instead of pieces of paper. Most people use their slideware as a glorified word processor. The best way to improve your slide deck presentations is to think of your slides as canvas to be drawn upon instead of pieces of paper to be written on. Video Presentation Tip – J.A.C.O.Ws: Remove jargon, acronyms, clichés, and overused words from your presentations. Clear and inclusive language will empower your presentations. Remove the J.A.C.O.Ws from your presentation and more people will understand your message. Use them to learn what your audience really thinks about you and your presentation. Do you allow enough time for Q&A? Did you start off strong? Did you end with a bang or a whimper? Audience responses will let you view your presentation from inside their mind. Let them tell you what they were thinking. Use an evaluation card, adjust your presentation based on the responses, and you’ll quickly improve your presentation skills. Watch a TED talk once a week – One of the best ways to get “great” is to have a clear vision of what “great” looks like. The easiest way to see A-level speakers in action is to watch TED talks on the web (TED.com). The talks offer a wide variety of styles, topics, and settings. You can even listen to the talk in English while seeing a translation of the text in another language. Watching a weekly TED should be essential screen time for all. As you become a better speaker, ask yourself, “Am I ready to speak on TED?” With time and practice you can get there. When you are ready, speak at a local TEDx event. Hundreds of cities around the world host local TED sanctioned events. Just remember to bring your passion. Video – Bring extra tech items. An extra set of cables might save your presentation. You’ll probably be fine with the VGA cable 99% of the time. However, when you find that the projector only has an HDMI connection you’ll be glad that you brought that one along. Along with extra cables you should bring spare batteries for everything that takes them, ie, wireless remote, timer, microphone. Countless presentations have gone unseen for lack of the right cord, connector, or fully charged battery. All of the above applies doubly if you are working on with a Mac because your chances of borrowing a “Thunderbolt to HDMI” connector at your presentation site are slim. Check yourself in the mirror – Always look at yourself in the mirror before taking the stage to speak. Your “stage” may be your office conference room with ten people as opposed to a conference hall with five hundred. Regardless of the venue, take a moment before putting yourself front and center. Make sure that everything is in place and where it should be. Don’t count on others to tell you that your tie is askew or your skirt is crooked. Someone will notice. Let it be you before you present yourself to your audience. Video Presentation Tip- Engage your audience more than just your words. Audience engagement is critical to the success of every presentation. If they’re checked-out, then they’re not hearing your message. Use vocal, facial, and spatial variety to capture their attention. Vocal – change your pitch, pace, and power. Facial – Smile and emote. Spatial – Do not stay locked down in one place. Move. Not like a ping-pong ball, but use your space. Video – Presentation Skills Las Vegas – Always bet on your audience. Add a short video to your PowerPoint – Grab attention during a Powerpoint presentation by using a short video snippet. The key word is short. Unless you’re Steven Spielberg or Gordon Parks stay within the 30 to 60 second range. If your video has action, music, and lots of cuts you could go longer, but generally shorter is better. Make sure that the video compliments your message. Let video support your message and raise attention levels at the same time. Video – Wear appropriate & comfortable clothing when you present. Do a full-dress rehearsal before your big presentation. Make sure that the clothes you want to wear are appropriate for the setting, the subject matter, and the audience. Also make sure that your fashion choices are comfortable to wear. Give them a test run to ensure that you can move freely. Plug into the power of your audience – There’s something special about a live performance of a presentation. No matter how well you rehearse, something magical happens when you speak your words to a live audience. Be ready for that moment of sensational transformation. Know your audience. Prepare your message. Practice all of the details large and small. But, know that when you place yourself front and center before an audience you’ll plug into their energy and supercharge your presentation. To see an audience energized presentation, watch the Houdini Pecha Kucha presented live at the Presentation Summit. Make it all about them – Your best presentation will be about your audience. It’ll be all about them and the answers that you provide to their concerns. The closer that you get to addressing their concerns, the better received your presentations will be. Don’t open with an agenda slide. Don’t open with a history of your company. Don’t open with your life story. Directly address the concerns of your audience. Let them know from the start that you understand their situation and then spend the rest of your time providing them with answers to their problems. Video Presentation Tip – Attend a presentation skills conference to accelerate your growth and expand your horizons. Speak at an appropriate audience level. Different audiences need different words and stories. Meet your audience at their level and they’ll be more engaged with your message. Consider the topic of space exploration by private companies. Your words, stories and language should differ when presenting the topic to astrophysicists versus government officials versus investment bankers. By using the most appropriate language your audiences will more easily hear your message. Present without slides – Have your slides become your visual crutch? Could you tell your story without them? If not, create a presentation that doesn’t use a slide deck. You’ll gain full audience attention as they focus on you. Without visual cues you’ll need to know your message like you breathe, without thought or hesitation. The lack of PowerPoint, Keynote, or Prezi will free you in many ways. Lose the slides and you’ll increase your connection with your audience. Imagine always facing your audience, instead of glancing at the screen behind you. Will this make you a better presenter? Yes, it will. Be human and reveal your personality – Don’t be a talking head. Audiences want a personable speaker who is unique. Fortunately, no one else is you. Show your unique personality when you deliver your message. People want to see you present, not you being someone else. The worst thing that you can do is to imitate someone else. Don’t present like Steve Jobs, Martin Luther King Jr., or your boss. Be you. Develop your own presentation style. Over time infuse it with more of you. People will hear your message while your personality shines through. Prepare a shortened version of your talk – There’s never enough time to deliver all of the information that you could present on your subject. Sometimes there’s even less time – a lot less. Things happen. The previous presenter spoke too long. The moderator cut your time in half. Maybe technology gremlins ate your data files. You can’t always control the factors that create a loss of your presentation time, but you can control your message. Know your message and critical take-away points well enough that you could deliver them in any time available. Separate handouts, slides and notes into three distinct items. Handouts are for your presentation details e.g., charts, statistics, maps, and text. Consider them footnotes of your presentation. Your slides contain your top-level points with a few lines of text and/or a strong image. Do not overload your slides with items that should be placed in your handout, nor long bullet-pointed lists, and certainly not full sentences. Your notes, which will be seen only by you, serve as a guide, like a road map, that can be used as you practice and present your presentation. Blank your screen. When presenting with PowerPoint slides, especially on a large screen, there’s always a battle between you and your images for audience attention. Large visuals always captivate attention. To break the spell and redirect attention back to you the speaker, blank your screen. You can either add a blank slide to your program or simply blank the screen at any point with a black screen by pressing the “B” key on your remote or keyboard. Pressing the “B” a second time will return you to the slide where you left off: the slide that was displayed when you blanked the screen. You can also produce a blank white screen by pressing the “W” key, but a large white screen can be very distracting, thus defeating the purpose of the pause. S.T.A.R. is an acronym for Something They’ll Always Remember – Follow presentation design expert Nancy Duarte’s advice, develop a S.T.A.R moment. Your “Something” could be evocative, emotional, shocking, or the use of a unique visual aid. It’s that moment of “Wow!” A S.T.A.R Moment lets your presentation message be remembered for all of the right reasons. Find your special “Something” and your audience will be talking about you long after your presentation is over. Do you have a S.T.A.R. Moment? For detailed information on S.T.A.R Moments, read “Resonate” by Nancy Duarte. Audiences want to see your passion. They crave it. They want to know that you deeply care about your subject. Passion warms your words. Passion highlights your message. Passion gives life to your cause. Presenters without passion are dull and boring. Who wants to be bored? Presenters who bring their own passion are lively, energized, and memorable for the right reason. Be passionate! The choice is yours. How will you be remembered? Watch your cursor – Little details mean a lot. During a recent two-hour presentation skills workshop I had left the cursor in the middle of the screen. Several people mentioned it in their evaluations. On reviewing a video of the session (You do video yourself, right?) I saw how it could have been distracting. A tiny cursor on a big screen makes a huge impression. As always, attention to the little things makes a big difference. Heighten the energy by rearranging the seating – Take control and change the seating so that people are close to each other. This will raise the energy level in the room. If necessary, block off the last row or remove some seats from the back. You can always bring them back. Much better to present to a packed room with standing room only than to a room of with gaps of people and empty chairs. Of course, this means that you will have to get there early. Know your message inside and out – Know it like you breathe, without hesitation or thought. Know it on an internal level so that no matter what happens you’ll always know the point to which you are leading your audience. Memorized and read presentations generally lack passion. Audiences want messages given from the heart instead of from the head. Know your audience. Your presentation should always be about them. Focusing on their needs will also serve as your guide to help you create an audience-centered presentation. If an element of your talk is not about them, remove it from your presentation. Address their concerns and provide clear solutions. Your audiences will give you high marks as a speaker. Smile – They’ll like you more. An occasional smile will also slow down your pace. Most presenters talk too fast. Smiling will make you pause. You’ll connect with your audience by smiling while they become more attentive during the pause. Smiling will also deepen your appearance of confidence. Connection, attention and confidence all from a smile. Try it! Tip the a/v person – Give a $10 tip to the a/v person who sets up your system for a presentation. You’ll make an impression on them that they’ll long remember. Next time, if you need them in an emergency, they’ll “go the extra distance” for your request. An early $10 investment could be difference in getting you set up right now or sometime later. Video yourself presenting – See the truth. It’s the only way to know what you really say and do. Review the presentation video with sound on/off. Small video cameras like Kodak’s Playfull waterproof costs under $100. Their Playtouch has an exterior mic jack for more options and costs less than $200. Both allow for HD video. Thanks Charles — some great tips here.